Thanks to Anonymous for bringing this to my attention! 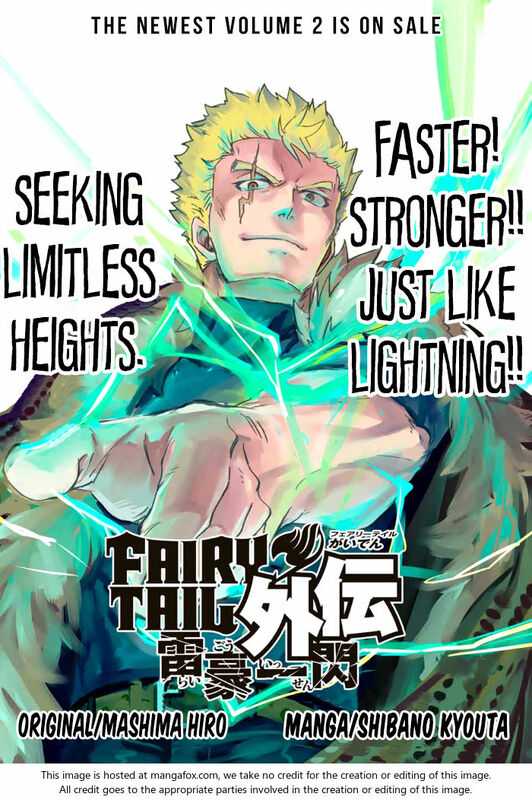 Gajeel, Sabretooth, Wendy Magical Girl, the... girls again for some reason, and the officially-canon Zero have now got a successor in the form of Laxus' spinoff, which is set after Tartarus but before Avatar. In other words, a perfect place to have a spinoff! Unlike the others, which just seem almost like someone rolled a dice, this placement feels completely earned and justified. 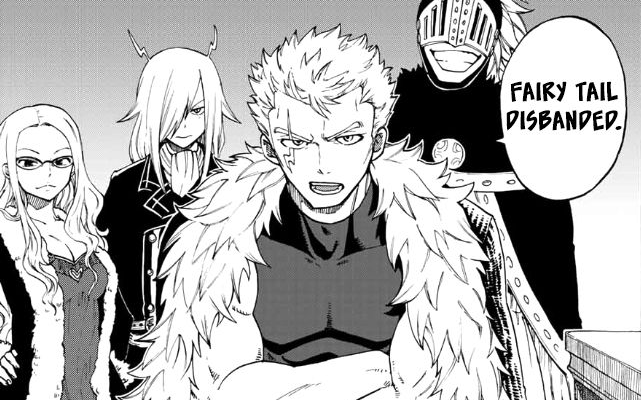 I've been wanting to hear more about what happened to Laxus between Tartarus and Avatar but Mashima-senpai won't let me know so this is the next-best thing! Huh. Laxus + Daft Punk... Holy hell, does anybody else think that would work amazingly?! Note: I'm only reviewing these two chapters. Not the entirety of the series. I may rank the spinoffs in an article one day, but for now it's this. Laxus is now officially a member of Blue Pegasus, sitting in front of everyone's favourite weirdo and might-as-well-be-the-guildmaster-because-we-never-see-Bob-but-for-some-reason-isn't Ichiya. 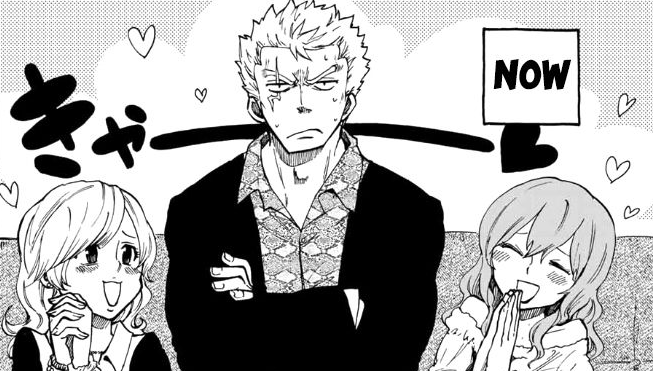 Ichiya's Trimen show annoyance for Laxus being so blatant about choosing any random guild, but Ichiya isn't so fooled and congratulates them in his... manner. Why everyone but Laxus smiling... is it because they hate the Guild? Ichiya challenges Laxus, to which he accepts. However, he's very unhappy to find that the jobs of the Guild are hosting for girls! 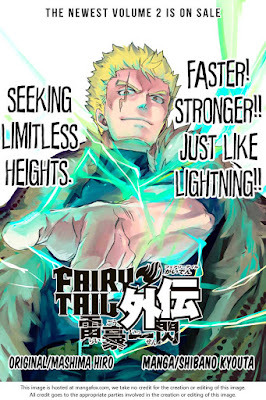 Laxus' badass, grumpy attitude is popular, and he starts to notice his team getting along well with the Guild. Suddenly, he lightning-zooms out to the door and says he's going to train. Aww... I really miss Ouran Highschool Host Club. Where is my Season 2?! The trio catch up to Laxus and ask him what's wrong, to which he says that they're impressing him for doing so well here. 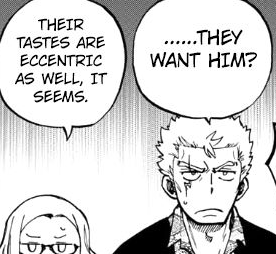 They deduce that Laxus isn't good at making friends and he's getting annoyed at this confusing, eccentric place. Especially Ichiya, whose popularity astounds him. He doesn't hate it though. This is when the Trimen and Jenny appear to say that Ichiya has been kidnapped by a Guild known as "Red Princess". This spinoff... If it keeps this up, it could become fantastic. It's so close! In chapter 2 (I figured I might as well review both chapters), Laxus uses his amazing detective skills to deduce that Red Princess are the culprits, who just so happen to be Blue Pegasus' rivals and they want Ichiya to join them. Yes Laxus, I'm confused also. Since the idiot is useless without his "parfum", Laxus decides that he and his gang will save Ichiya. We then go to Red Princess' Guild, where Master Briana is torturing Ichiya by OH GOD.... WHY?! ......Anyway, Laxus is justifiably disgusted and as he's about to leave because that is so utterly disgusting that I want to claw my eyes out, Briana seems to be challenging Laxus because he doesn't just to get to walk away scot-free. 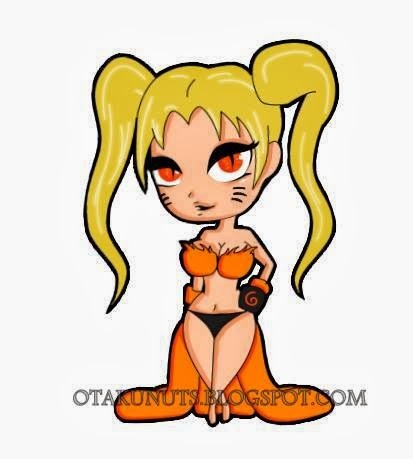 The spinoffs of Fairy Tail haven't been a huge attraction to me. Most of them aren't that funny or are drawn in an uncomfortable style, or they just aren't even necessary to the plot as a whole and even tend to contradict the canon storyline. So as far as this spinoff goes... I found myself surprisingly enjoying it. Is it perfect? No, definitely not. No series that would show THAT image can ever be perfect, at least not when a God is meant to exist that will keep us safe from those harmful visuals, but the series is fun. Blue Pegasus have always been a hilarious highlight for me, and Laxus was always on my list of "Characters Who Deserve More Damn Screentime So I Can Kiss Their Soppy Faces", so it's win-win for me. I do wish the others got more time, since the canon never uses Bickslow, Evergreen or Freed enough and the Trimen + Jenny are tons of fun, but I enjoyed the Laxus and Ichiya dynamic. It's such an odd pairing, and yet they work off each other so well that it feels almost criminal we never got this before (except for the Wahl battle). I'm glad I read this one, even if it was lacking in areas, and this might be the first non-Mashima spinoff I actually find interesting enough to keep checking out. 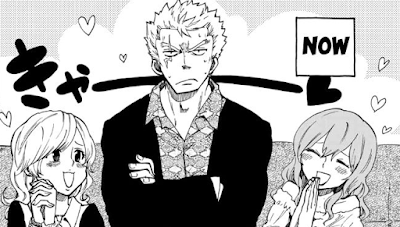 Character of the Week: Laxus because his reactions are the most appropriate. Best Part: Laxus and Ichiya. Worst Part: Proof that there is no God. Just a quick reminder of the horrors that Ichiya is capable of. WHY, O LORD, HATH THOU BLINDED MINE EYES LIKE SO?!!!! ...yes, I'm sorry. It's my fault for clicking on this, I understand... forgive me, for I did not know what I said. ...but yeah. Thanks for reviewing this; I didn't know it existed either! I daresay this is enough of a reason to go and hunt down this series before it gets big enough to swallow me whole XD.